Beautiful interior plantation shutters Hastings, brought to you by Just Shutters, the Plantation Shutter experts: call us now on 01892 575 858. Our bespoke made-to-measure shutters perfectly enhance your windows and doors, and even make the perfect wardrobes and room dividers, whatever the shape or size. With the biggest range of shutter styles, materials and finishes in the UK, we create breath-taking solutions whatever your taste and sale. So whether you are looking for a modern sleek style, or timeless elegance, shutters look simply beautiful as a luxurious and super stylish alternative to curtains and blinds. Shutters have many benefits aside from the aesthetic. 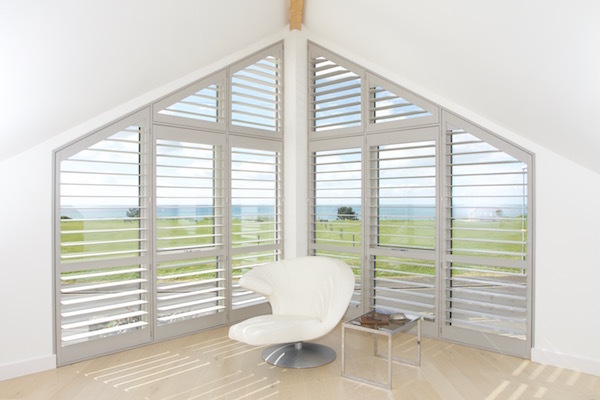 A room with shutters benefits from an array of light and shading options, from perfectly private whilst letting the light in, to full shade when closed and even folding back entirely to leave unencumbered windows that can be cleaned, opened and enjoyed free from nets, curtains or blinds. – And we are so confident in these benefits, our shutters come with a Just Shutters lifetime guarantee. David Stansbury is your local shutter specialist, he offers an expert personal service that has earned him an unsurpassed reputation for quality and service over his years as Just Shutters Kent MD. From initial survey through to order and installation, customer service is at the very heart of what we do. Let us show you what we can do for your home and how unbeatable we are in our service, quality and value; call us today on 01892 575 858 or follow the links below to get in touch.